You can view/download the PDF for this set including the licence agreement, technical info and a patchlist here. 102 patches, up to 8 Macros assigned per patch. Programmed 100% wet for bus insert. 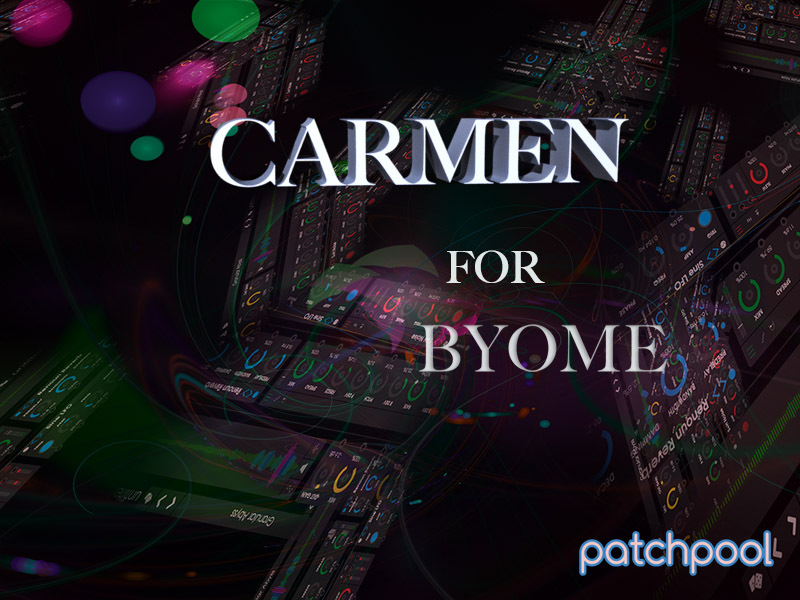 All demos were produced using only effects provided by the patches from Carmen. I am absolutely blown away by the quality of this pack. Carmen is truly top-notch and downright beautiful! I can't stop playing with it.. Thank you for sharing your amazing work with me! - BYOME enthusiast from the US. AWESOME Simon! These will be such great departure points for such an endless soundscape BYOME has to offer. There will be so much production value in your release alone just for speed of workflow under a ticking clock. Everything I have heard from you so far is instantly inspirational, and I am sure with some basic knowledge of BYOME one will be able to adjust and fine tune to one specific needs. The key being for me, when I demoed BYOME it was evident that this was an instant inspiration machine when you have painted yourself into a corner. So your hard work in wrapping your head around the whole thing and creating all these inspiring gates of departure are a true goldmine and a no-brainer investment for me. Sooo exited for the final release. - a guy named Peter on Gearslutz after receiving the pre-released Carmen patches. - BYOME-ist from Germany on KVR. BYOME brings something new to the sonic table.